My kids are in the midst of a Minecraft craze (Minecraft is a game on the computer), so I created this cake for a Cub Scout fundraiser. The cake is a 3-layer 8″ square cake (vanilla and chocolate) covered with chocolate buttercream and crushed Oreo cookies (to look like dirt). I put a layer of green fondant on top and piped green grass with a grass tip. The figures are crafted from colored fondant (with the help of my kids) and the name plate is made from pearler beads. The cake was a HUGE hit with all of the elementary-aged boys and eventually sold for $120 at the event! If your kid hasn’t discover Minecraft yet, just you wait! I’ve somehow become the family birthday cake baker. I’ve made some great cakes and even impressed myself. Of course, though, when it comes to my own sons, they get plain boring cakes. Well, not this time. My 14 year old, has requested a Minecraft cake. I will do my best to replicate yours. Thanks for the great ideas (fondant, perler beads)! Thank you, Despina! I get most of my inspiration from the Internet, so I’m happy to pass it along! And the perler beads came out of a moment of desperation when I was trying to make a pick-ax out of fondant :0). Have fun, I’m sure your boys will appreciate it! Dear Laurie, is the cake 8″ x 8 x 8? This one is an 8×8 and serves about 20. You could do a 10×10 and get 25-30 servings. Hope that helps! Good luck, Emma! It really isn’t hard, just takes some time to make the figures. Keep me posted on your progress! Thank you so mug an your cake is so awesome!!! Hi Christina, I actually just googled minecraft perler beads and one similar was on there. If you zoom in, you can count the number of beads in the letters. Hope this helps! I assume you are referring to the green fondant on top? I just rolled it out about 1-inch larger than the cake on all sides and , after placing it on top, smoothed it over the edges of the iced cake. Hope this answers your question! Love this cake and am going to make it for a friends son! I was just wondering if you used any supports between your layers. I don’t want mine to smash before his party! This will be my first attempt at a layered cake. Hi Catdwebb, thanks for checking out my website! I typically make a really dense 3-layer chocolate cake for the Minecraft cake. I use the Epicurious double choc cake recipe with a few tweaks to make it my own (you can google it). 1-1/3 times recipe goes well into 3 8″ square pans. If your cake is dense enough, you won’t need supports for 3 layers. If you do feel that the layers may slide, insert 3 long bamboo skewers into them from top to bottom once they are stacked with icing between layers, that will help. Good luck, thanks for the question! Am I correct in that you didn’t icing the cake itself just the top? Your cake is by far the best I’ve seen and I so want to make this for my boyfriend’s birthday. Your cake looks real and not covered in fondant which is a plus! Also would you be able to just pipe grass all over the top or would it be best to do the fondant base? Thanks for the questions, glad you like the cake! Good luck, let me know how yours turns out! Nope, I frosted the sides with choc buttercream and then pressed the Oreos onto it while it was still soft. Thank you, Laurie! I am making this next week! I’ll try to post a photograph! Merry Christmas and Happy New Year! Did you mix the Oreos into the icing before putting it on the cake? I made my version today..meringue buttercream didnt hold grass shape well enough. Made me sad!!! Also…couldnt get my green bright enough. How did you get it so bright?? It was a gel paste food color….Kelly green mixed with leaf green. Sorry to hear your grass didn’t hold it’s shape. Does need to be very stiff. Beautiful cake! I will making this for my son’s birthday next month. You did a great job! About how many servings do you think this makes? 30? For and 8″x8″ triple layer, you can get from 25-30 servings. Pingback: La Fundación • ¡Felicidades Lord Cacique! I just love this cake and am going to attempt it this weekend for my son’s 7th birthday. He is going to love it ! Do you chill or freeze the cake before adding the frosting ? How far in advance do you decorate it ? I’m trying to work out my timings for party day. I’m afraid I’m cheating and using bought Steve and Creeper figures though – my artistic talents dont stretch that far. Hi Linda, I typically make my cakes a day or 2 in advance and freeze the layers (tightly wrapped in plastic wrap). It makes the cake much easier to fill and frost (or torte, if you’re cutting a layer in half) because there are fewer crumbs. So to answer your question, “Yes” you can chill or freeze your cake, but it isn’t necessary. You can even fill the cake and do a thin crumb coat over the entire cake a day in advance, stick it in the fridge to firm up, and do the final frosting and decorating the day of your party. Hope this helps, thanks for visiting the website and good luck with your cake! Thanks! Good luck with it :0)!! Is the grass made out of fondant also? Thanks – are there directions somewhere other than this page? I only saw that the cake was frosted in chocolate buttercream and oreo cookies, and then grass so I need to make buttercream frosting and then color it, right? Here’s what the description said: The cake is a 3-layer 8″ square cake (vanilla and chocolate) covered with chocolate buttercream and crushed Oreo cookies (to look like dirt). I put a layer of green fondant on top and piped green grass with a grass tip. That’s correct….sometimes, when I have time and extra fondant, I cover the top with green fondant and then pipe green buttercream grass around the edges. Other times, I have frosted the top smooth with green buttercream and then piped grass around the edges with the grass tip. 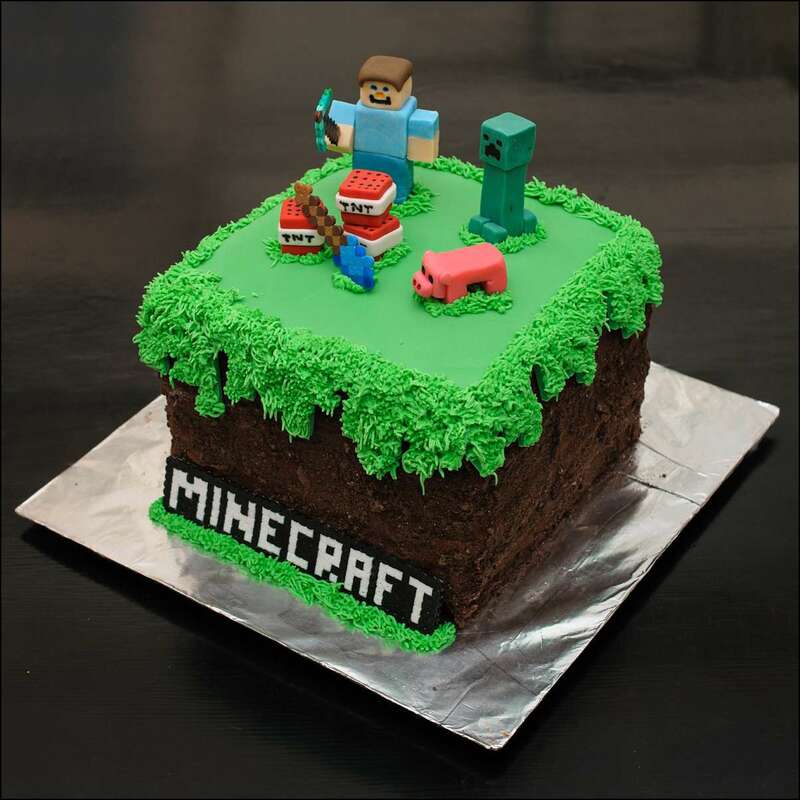 do you sell the minecraft cakes and if so how much time do you need to order one and do you ship ?? I actually responded back to your request last evening; you must not have gotten it….I don’t ship the entire cake (too costly), but you could order just the fondant topper set. The price is $52 for 6 figures (Steve, creeper, pig, and 3 TNT blocks). Shipping and handling will be around $10 for 2-day shipping to RI (I don’t know exactly how much without a zip code). The Creeper and TNT cupcake toppers are $20/doz (and to answer your initial question, those are all I have at this time). I need approx. 2 weeks after the order goes through to get them done in order for them to dry to ship. Please let me know if you’re interested and I’ll see if I can fit you in. Is there any way you can make this cake for my son’s 6th b day party?, it’s on the 8th of august….I have the figurines that are toy figures….so would save time…..how much do you charge for the cake?, and how many people does it serve?? Hi Lisa, I’m sorry I’m on vacation until next weekend and am booked thru Aug 16th. Thanks so much for the inquiry, though…maybe next year! I can’t find Minecraft or paw patrol fondant molds anywhere. Do you know where I can find them. So I can make the figurines? Hi Jill, I don’t know about a mold. I make all of mine from fondant by hand. Sorry I can’t be more helpful! Do you take orders for birthday cakes? 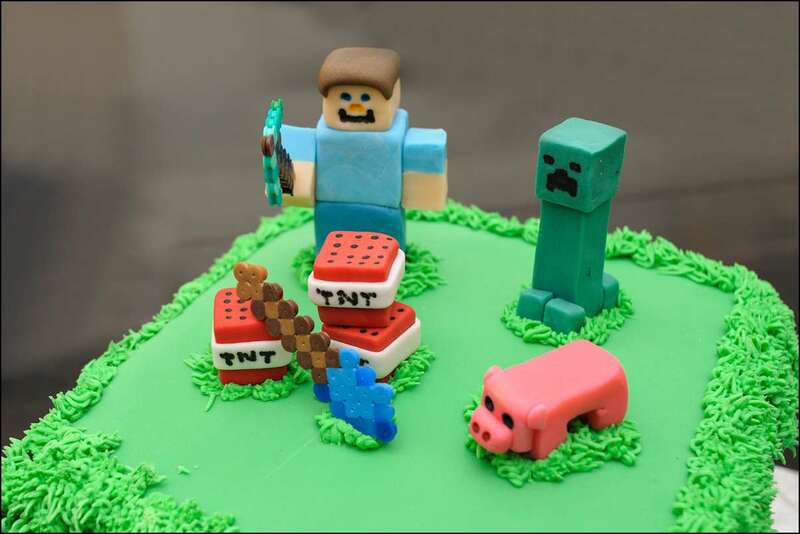 Kindly send me the prices of the minecraft cakes. Hi Grishma–I do take orders for cakes, but I don’t ship entire cakes, only the toppers. The set of 6 fondant toppers (Steve, Creeper, Pig, 3 TNTs)is $52 plus shipping. If you’re located near me (Poland, OH), I can do a cake for you for pick up (price depends on size). Are you located in my area or are you interested in the toppers? They take 2-3 weeks to make, dry and ship. Thanks for the inquiry!